So I was lurking around Offbeat Bride, as I often do, and decided to post an update about my finished 1,000 Origami Cranes. 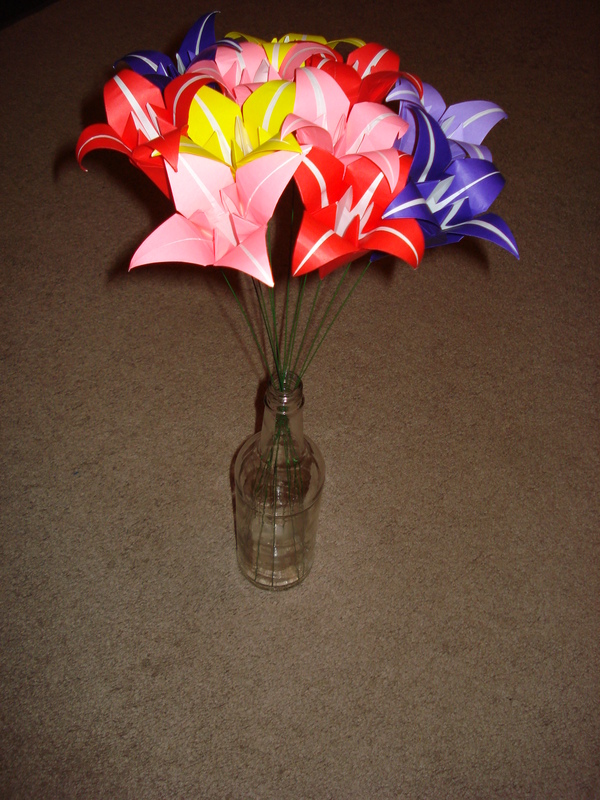 A fellow member posted on my update and so I checked out her updates and saw the most lovely bouquet of origami lilies and fell in LOVE so I decided I had to try to make one! I made a single lily and it was relatively easy and didn’t take a horribly long time so I decided to make a ton of multi-colors and see if I could at least use them in the centerpieces if they didn’t work out as a bouquet. I’m still undecided on if they will be a bouquet(s) and/or centerpiece flowers, but I decided I’m going to make as many as possible and then decide later! The "vase" is one of my unpainted centerpiece bottles that will be painted after it finally warms up outside! 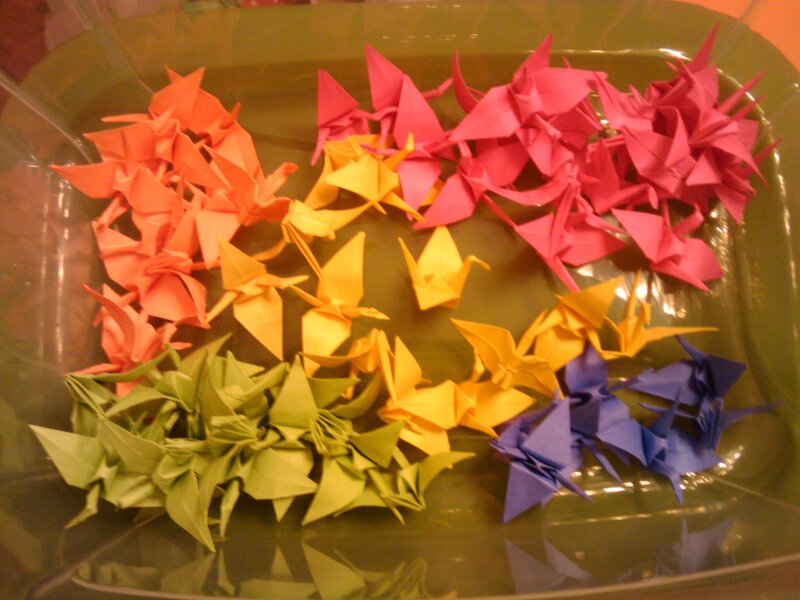 70 mini cranes DONE! Sorry for another low-resolution image, I STILL can't find my camera battery charger! First phone blog post so we will see how it goes! I have some small 2.5 inch square colored copy paper so I decided to start practicing making origami cranes. I’ve attached a photo of the first attempt. Since the paper is so small it was difficult and the crane is only about an inch large (each square on my mat is one inch.. for scale in the photo). I definitely need a lot more practice and this is going to take forever! Good thing I bought real origami paper that should be easier to fold. Single Flowers from Folding Trees. I'll upload my photos into the post later. My first DIY project I started a couple of weeks ago was to start making kusudama out of recycled magazine pages. It’s relatively easy to do, gives me something to preoccupy myself with while I’m watching t.v. and it’s FREE since I have everything already. It’s also “green” and eco-conscious since I am reusing something that would potentially end up in the trash anyways. I know I can recycle magazines, but I prefer to UP-cycle and reuse things instead since a lot of energy goes into recycling.